Summary: We must move beyond "comparative gratitude" and an awareness of our good fortune, to "vertical thanks to God who is the source of all blessings. Thanksgiving, like Christmas, is firmly woven into the American fabric as a tradition. I don’t mean this in a critical way – it is a wonderful occasion to gather families and to share a meal together (something rarer and rarer in this day). Just as we cannot truly celebrate the meaning of Christmas without looking to the birth of our Savior Jesus, we cannot really understand what Thanksgiving is for without looking to the gracious God who blesses us. 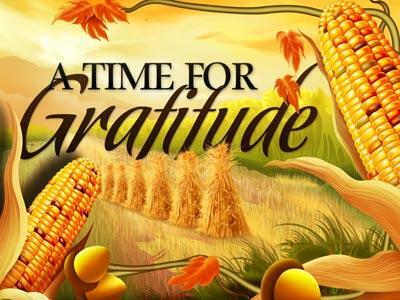 · Lots of people really try hard to observe these two holidays without making them holy days. They do their best to play Santa and buy gifts for everyone in the family, but they ignore the Babe in the Manger who is God’s precious gift to us. 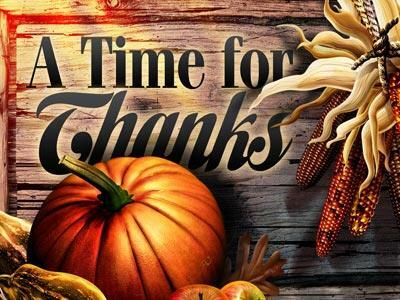 · At Thanksgiving, they cook a banquet for their family and friends, and may even share a sincere thought or two about all the people they are thankful to – their husband or wife, their children, the company they work for, the neighborhood, their nation. · Without God at the center, there is something missing – they miss celebrating the SOURCE of all those blessings, and that source is God. We cannot fully express our thanks to God only by comparing our lot with others. Seeing we are more fortunate than others certainly puts things in perspective, and helps us be more grateful for what we do have. Some of the most ungrateful creatures on earth are American teenage girls. Having had two of them, I feel qualified to speak on the subject. Dear Abby published letters from two teenage girls one Thanksgiving. The first one came from one of these spoiled brats. Happiness is knowing your parents won’t almost kill you if you come home a little late. Happiness is having your own bedroom...Happiness is getting the telephone you’ve been praying for...Happiness is having parents who don’t fight. Happiness is something I don’t have. Happiness is being able to walk. 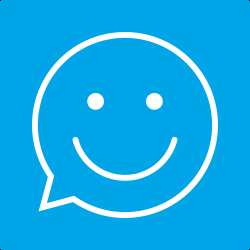 Happiness is being able to talk. Happiness is being able to hear. Unhappiness is reading a letter from a fifteen-year-old girl who can do all of these things and still says she isn’t happy. I can see. I cannot talk. I cannot hear. I cannot walk. (Signed) Thirteen and VERY Happy. Americans are pretty good at “comparative gratitude.” Missionaries and those serving in foreign lands remind us just how different life is where in the “third world” countries, and just how blessed we are to live here. 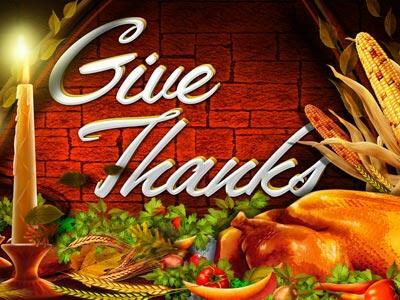 Some people are appreciative by nature, but some are not; and it is these latter people who especially need God’s power to express thanksgiving. We should remember that every good gift comes from God and that He is (as the theologians put it) "the Source, Support, and End of all things." The very breath in our mouths is the free gift of God. Thankfulness is the opposite of selfishness. The selfish person says, "I deserve what comes to me! Other people ought to make me happy." But the mature Christian realizes that life is a gift from God, and that the blessings of life come only from His bountiful hand. Warren W. Wiersbe in “A Time To Be Renewed” Christianity Today, Vol. 32, no. 17. As we mature in faith, we become more aware of our blessings, and of their source in God. Saying Thank you to God is expressing gratitude for life itself. Perhaps this is why it is more comfortable to thank other people, than it is to thank God. We feel differently about our mothers than we do other members of our family. We may have spent years growing up with a brother or sister, sharing a host of life experiences with them. Our mothers, however, represent the very gift of life. They carried us inside their bodies, They were there in the first moments of our life, giving birth to us, they nurtured us as babies and children. We must move beyond "comparative gratitude" and an awareness of our good fortune, to "vertical thanks to God who is the source of all blessings.